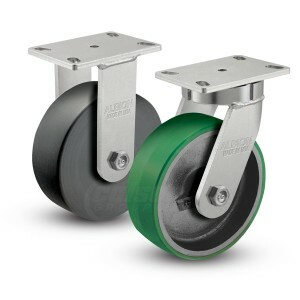 Albion 310 Series casters are constructed from high quality, heat-treated AISI 1045 laser-cut steel. Precision-machined kingpinless swivel raceways and fully welded legs (inside and out) deliver superior strength in rugged applications. Explore Albion 410 Series for different top plate sizes and caster capacities. In the field or on-the-go? Download Caster CAD 3D to configure CAD models wherever you are. Use drop-down menus below to change various caster specifications. Update Preview to see any changes. Use “CAD Download” tab to download CAD models and PDF datasheets.